For $1342 per pax, you get a 9D8N Northern Germany Guided Tour to Frankfurt, Berlin and More with Hotel Stays, Meals and a 3-Day German Rail Pass (worth $2106). Experience Northern Germany in a quick 9 day tour of some of the most spectacular cities in Germany. Grouponers get put up in 3-Star superior or 4-star accommodations during the trip before heading out to tour great sights and sounds. 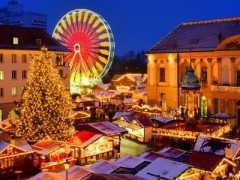 Arrive in Frankfurt and enjoy snow covered streets in this bustling city at your own leisure. Head to the city's architectural masterpieces such as the museums and churches dating back to a few centuries ago. Following Frankfurt is Duesseldorf. Travel there by German Rail at your own timing and then explore this modern and fashional city on your own. Visit Old Town, which was almost completely destroyed in WWII but rebuilt following old blueprints. Or climb up The Rhine Tower, standing at 234m tall, for a magnificent view of the city. Shopping happens the next day at Koengisalle, followed by sightseeing at the city Centre. Again, travel at your own timing to Hannover on German Rail. Unlike many other European cities that have maintained most of its renaissance period buildings, Hannover is pretty new with its architecture but is filled with flowery landscapes. The Royal Gardens of Herrenhausen features sprawling grounds of botanics, neatly trimmed hedges and geometric layouts. Finally, make your way to Berlin. A full day is dedicated to sightseeing some of its historical sights. Stop by Brandenburg Gate, Unter den Linden Boulevard, German State Opera House, Reichstag (Parliament) Building, Potsdamer Platz and East Side Gallery just to name a few. These places are pivotal to Germany's history. Take note especially of East Side Gallery, a 1.3km section of the Berlin Wall that serves as an international memorial of freedom. The long day of sightseeing ends with a trip to Kurfürstendamm, for shopping at KaDeWe, Europe's largest departmental store. Taste some German fusion cuisine too, such as the Berliner Currywurst with a side serving of sauerkraut.